The bale fork is an important attachment that can help to transport and load round bales from the ground onto the bale feeder or a trailer. You can find this handy to use attachment in the inexhaustible list of genuine Bobcat products available for customers, and it’s easy to install the attachment as an extra part. 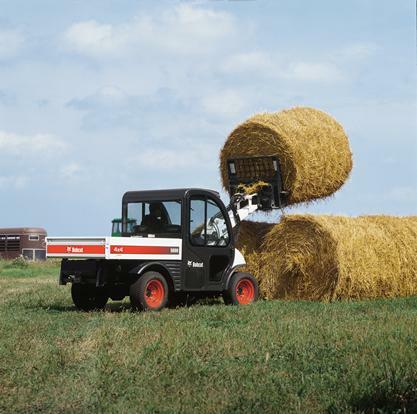 The material used to make each bale fork attachment is durable and strong. It can last for a very long time and is easy to maintain. However, if you want to get its servicing done by the professional experts at Bobcat, then it can be taken care of. The experts will provide you with great service that is always cost effective. The spacious handles of the bale fork helps in loading the bale onto the feeder with much ease and the simple design will enhance the usage and longevity of the attachment. Moreover, it is powerful and moves swiftly within the moving range. Bobcat’s machines and attachments can be used for a wide range of projects, including agricultural projects or for construction purposes. The performance of their machines have been recorded by many customers throughout the last 50 years, and every time a new machine emerges, Bobcat makes sure that it is as flawless as its predecessors.